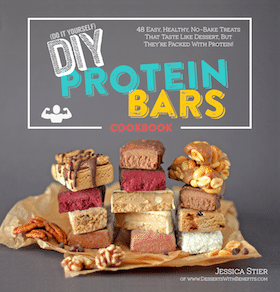 What’s got bananas, chocolate, and peanut butter, and is both super easy to make and eat? Chunky Monkey Pull Apart Bread! A loaf made of layers of dough, filled with sweet bananas, rich peanut butter, and decadent chocolate chips. You can’t say “no” to a second (or third) piece of this deliciousness… but that’s totally okay… this easy, five-ingredient recipe is dairy free, vegan, and doesn’t have any added sugar! This Pull Apart Loaf was inspired by Ben & Jerry’s Chunky Monkey ice cream. You know, the one with bananas, chocolate chunks, and walnuts? But here I used peanut butter instead of walnuts. And I made this treat dairy free, vegan, and low sugar while I was at it. A far cry from that nanner ice cream, which has 1,200 calories, 72g of fat, and a whopping 112g of sugar per pint!! That means there’s nearly ⅔ cup of sugar in a single pint, which, let’s be real, we can all eat in one sitting. I mean, I exclusively eat ice cream by the pint (thanks to healthier options nowadays)… I don’t remember the last time I didn’t eat an entire pint. But anyways, THIS PULL APART BREAD. Unquestionably one of the most addicting things I have ever stuffed into my pie hole. Compared side-by-side with that pint of Ben & Jerry’s, this loaf definitely wins. This Chunky Monkey Pull Apart Bread is unquestionably one of the most addicting things you’ll ever eat. And while this loaf probably seems time-consuming or difficult to make, it’s actually super quick and easy! You start off with a tube of Immaculate Baking Co.’s organic flaky biscuits. 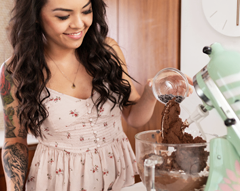 Unlike other brands of biscuit dough, Immaculate Baking Co. doesn’t use any yucky ingredients like bleached flour, hydrogenated oils, preservatives, and artificial flavors, so you know the base of this recipe is already off to a good start. Just pop open the tube, separate the biscuits, and split the biscuits in half. Then, you mash some bananas, mix it with natural peanut butter and a dash of vanilla to create a nana-nut “jam” of sorts. Roll out the biscuits into rounds about double their original size, spread on the “jam,” sprinkle with chocolate chips, and start layering it in a loaf pan with sliced bananas! Once the loaf pan is filled, toss a few chocolate chips on top and get your masterpiece in the oven. Chocolate, Peanut Butter, and Bananas come together to create the tastiest, most addictive Pull Apart Bread you thought you could only dream of. Who needs chunky monkey ice cream with a cherry on top when you’ve got this Chunky Monkey Pull Apart Bread with chocolate chips inside AND on top? Because chocolate will always beat a cherry on top. Amirite? 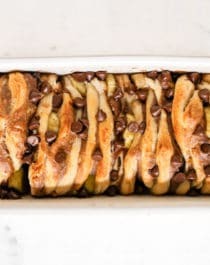 This Chunky Monkey Pull Apart Bread is a loaf made of biscuit dough layers, sweet bananas, rich peanut butter, and decadent chocolate chips. Adjust the baking rack to the lower ⅓ of your oven. Preheat the oven to 350 degrees Fahrenheit. Pop open the tube of flaky biscuits and separate the biscuits onto a silicone baking mat. Split each biscuit in half to create 16 thinner biscuits. In a bowl, whisk together the mashed bananas and vanilla extract. Then, whisk in the peanut butter to create a peanut butter-banana "jam." Roll out each of the split biscuits into rounds about double their original size (this is easy if you do it on another silicone baking mat and top the biscuit with a piece of parchment paper so it doesn't stick to the rolling pin). Spread the "jam" over the rolled out biscuits and sprinkle with the chocolate chips (reserve one tablespoon of the chocolate chips for topping). Spray a 9x5" loaf pan with cooking spray and lean it at a steep angle so you can easily layer the circles of dough. Stack the circles of dough in the loaf pan, adding a sliced banana in between the layers, alternating the spot you put the banana so each piece is different. Once the pan is filled, sprinkle the remaining chocolate chips on top. Bake for ~40 minutes, or until the center is firm when tapped. Let cool, then enjoy! To send this Pull Apart Bread over the top, serve it alongside warmed, drippy peanut butter, melted dark chocolate, and freshly sliced bananas! Chunky Monkey’s banana-chocolate-peanut butter goodness meets Pull Apart Bread in this simple yet delicious Chunky Monkey Pull Apart Bread! What a heavenly result! Now I REALLY want to try making this. 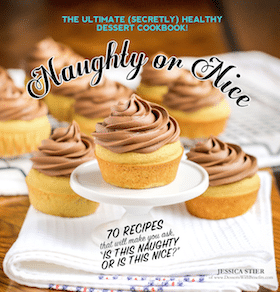 Even more amazing–this recipe is so so easy! I haven’t had pull apart bread in God knows how long, so this will be a really nice memory refresher of a glorious dessert! Oh my Helena! You’ve done it again! Your creativity… wow. Just wow. Good thing these aren’t gluten free. It’s the only thing saving me from making this ASAP and inhaling the entire loaf. Lol.